Dealnloot will always stand first to give the best user satisfaction with timely updated deals and loots. In addition to it, we also conduct diffrent types of Giveaways & Contests to make your experience “The Best” with us. This time now are now going to conduct the Housie Contest which we also call it as Tambola Game. However conducting this contest is hectic task for us because its not easy to generate tickets for everyone. But nothing is harder for us when we do it to our Dealnlooters. 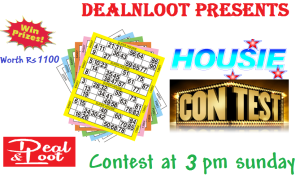 So get ready this Sunday i.e., 1st May 2016 to play the contest and win exciting prizes (Paytm cash / Mobile Recharge) in addition with a lot of recreation for the weekend. How to enter this contest ? 1. You need to have a housie ticket to play this game. A housie ticket consists of 15 numbers in 3 rows. 2. Well no hard work to get the ticket. Just comment below that you want a ticket to play this game and it will be sent to you within 24 hours in your email id. You can ask for ticket till Sunday 12 PM only , after that no tickets would be issued. 3. Once you have a ticket in your mailbox, all you need to do is come back here at 3 PM on Sunday and play the thrilling game with us !! How this exciting game is played ? >> The ticket that will sent to you will contain certain numbers from 1 to 90. >> We will start announcing the numbers at exact 3 PM with each new number announced after 1 minute. >> What you need to do is just check that whether the number announced is there in your ticket or not. If it is there, you are lucky !! Just cut that number from your ticket. Tip – Make a exact copy of ticket you received on your email id on any paper sheet. Now as the contest starts, take this paper sheet and a pen and start cutting the numbers if they match with what we will announce. Two participants whose any 5 numbers of the ticket are cut out firstly will get this prize. First winner will get Rs 100 and second winner will get Rs 50. Each housie ticket contains 4 numbers at extreme positions ( left and right) . 1st and last numbers of top and bottom rows – These are known as corners in a ticket. >> In this ticket, 8,66,18,87 are four corners. 2 participants who gets the fastest 4 corners to get cut out wins this prize. First winner will get Rs 100 and second winner will get Rs 50. As we told earlier, each ticket has 3 rows with top row called 1st row, middle one 2nd and bottom one – 3rd. Two participants whose all the number in the 1st row are cut out fastest wins this prize. For eg – In the ticket above, numbers –8,10,42,50 and 66 are of 1st row. Two participants whose all the number in the 2nd row are cut out fastest wins this prize. For eg – In the ticket above, numbers –24,34,68, 72 and 81 are of 2nd row. Two participants whose all the number in the 3rd row are cut out fastest wins this prize. For eg – In the ticket above, numbers –18, 36, 48, 53 and 87 are of 3rd row. Well this is the grand prize !! Two participant whose all numbers are cut out at the earliest wins this prize. How to claim housie prize ? >> As soon as you reach any of the prize you need to claim it immediately in the comments by writing that you have completed this task along with your Ticket Number mentioned on the housie ticket which we send to you. >> We will immediately check it and if you are right then you will be announced winner but if your claim goes wrong, you will be disqualified whether it was intentional or not. So get ready to witness the fun !! Claim your housie tickets now !! 5. Under any circumstances, the decision of Dealnloot is final and Dealnloot has the right to change the terms at any time without prior notice. Can u please confirm.. That the game organized by you and this one both are same or not.. Please response..
Cant reply in the above comment. Great contest admin.. I also want a ticket for this. Superb admin…i also want a ticket. Exciting..count me in.please send me a ticket. I want a ticket to this game!! Going well dealnloot! Admin I also want a cricket!.. Jabra fan of dealnloot! Please give me ticket admin!!!! Give me the ticket !! admin!! Thanks Dealnloot. I want ticket to play this game. Hey admin, Please send me a ticket….. I want a ticket to play this game. I too want a ticket admin bhai. Interesting Game…….I want a ticket. one ticket for me also. I want to play this game so plz send one ticket plz. I want One ticket for me..
one ticket for me pls. 1 ticket for me pls..!!! can I get a ticket please, thanks. 1 ticket for me as well please. i want one tckt plz..
Admin sir please give me one ticket. one ticket. Thanks in Advance. One ticket please. Thanks in Advance. Admin I also need ticket to play housie…. Send me a ticket too mate…!! Please send 1 ticket here!! I’m ready. I want it. Send me one ticket please. You thinks about your site followers. I WANT A TICKET PLEASE! I want a ticket to play. I want to try my luck..can i have ticket plz!!! I want ticket to play..
Me too want a ticket. I WANT A TICKET PLS. I want to play the game, ticket please. I want to participate in this game. I want to try my luck. Can i have a ticket please . Admin i commented yesterday also ,but didn’t got any ticket as yet.please send me one ticket. Hii ! !would love to play. Please send the ticket. Pls send me a ticket.. Please send me the ticket..
yet I have not got the ticket. Dear admin ji payzapp ke offer kya aayenge ab agle mahine matlab ke kal kya offer aane wale hai plz tell me i am requested ke aap 1 din pehle bata dete ho plz tell me ke kal kya offer aane wale hai love to deal n loot plz tell me………..
Sir, I Also Want To Play The Game. So Please Give Me A Ticket. Hi Dealnloot, i will play. Please send the ticket ! I’d like to play. Send me a ticket. I would like to participate. . can I have a ticket please.